Yes, I know that is the way our family is usually spoken of. But then I’m not a tame Goose, you know. We wild fellows think we know a little more than the one which waddles about the duck-pond in your back yard. He sticks to one old place all the time. Waddles and talks and looks the same year after year. We migratory birds, on the other hand, fly from place to place. Our summers are passed here, our winters there; so that we pick up a thing or two the common Goose never dreams of. Yes, some people call me that. I don’t know why, unless my Honk, honk, honk! sounds like a laugh. Perhaps, though, it is because the look about my mouth is so pleasant. Did you ever see a flock of us in motion, in October or November, going to our winter home? Ah, that is a sight! When the time comes for us to start, we form ourselves into a figure like this >· a big gander taking the lead where the dot is. Such a honk, honk, honking you never heard. People who have heard us, and seen us, say it sounds like a great army overhead. Where do we live in summer, and what do we eat? You will find us throughout the whole of North America, but in greater numbers on the Pacific coast. The fresh-water lakes are our favorite resorts. We visit the wheat fields and corn fields, nibbling the young, tender blades and feeding on the scattered grain. The farmers don’t like it a bit, but we don’t care. That is the reason our flesh tastes so sweet. My, how you talk! It is only we old fellows that are tough, we fellows over a year old. But of course a great many people don’t know that, or don’t care. Why, I once heard of a gander that had waddled around a barnyard for five long years. Thanksgiving Day arrived, and they roasted him for dinner. Think of eating an old, old friend like that! Where do we build our nests? Away up north, in Alaska, and on the islands of the Arctic Sea. We make them of hay, feathers, and down, building them in hollow places on the ground. Six. I am very good to my mate, and an affectionate father. Range—North America, breeding far northward; in winter south to Mexico and Cuba, rare on the Atlantic coast. Nest—On the ground, of grasses lined with down. Eggs—Six or seven, dull greenish-yellow with obscure darker tints. Greater White-fronted Goose by Ashley Fisher (xeno-canto) recorded in U.K.
Flock flying over by Jonathon Jongsma (xeno-canto) recorded in U.S. The Greater White-fronted Goose (Anser albifrons) is a species of goose. The Greater White-fronted Goose is more closely related to the smaller Lesser White-fronted Goose (A. erythropus). In Europe it has been known as simply “White-fronted Goose”; in North America it is known as the Greater White-fronted Goose (or “Greater Whitefront”), and this name is also increasingly adopted internationally. It is named for the patch of white feathers bordering the base of its bill. But even more distinctive are the salt-and-pepper markings on the breast of adult birds, which is why the goose is colloquially called the “Specklebelly” in North America. These Geese belong to the Anatidae – Ducks, Geese & Swans Family. Greater White-fronted Geese are 25–32 in (64–81 cm) in length, have a 51–65 in (130–165 cm) wingspan and weigh 4.3–7.3 lb (1.93–3.31 kg). They have bright orange legs and mouse-coloured upper wing-coverts. They are smaller than Greylag Geese. As well as being larger than the Lesser White-fronted Goose, the Greater White-fronted Goose lacks the yellow eye-ring of that species, and the white facial blaze does not extend upwards so far as in Lesser. The male is typical larger in size, both sexes are similar in appearance – greyish brown birds with light grey breasts dappled with dark brown to black blotches and bars. Both males and females also have a pinkish bill and orange legs and feet. 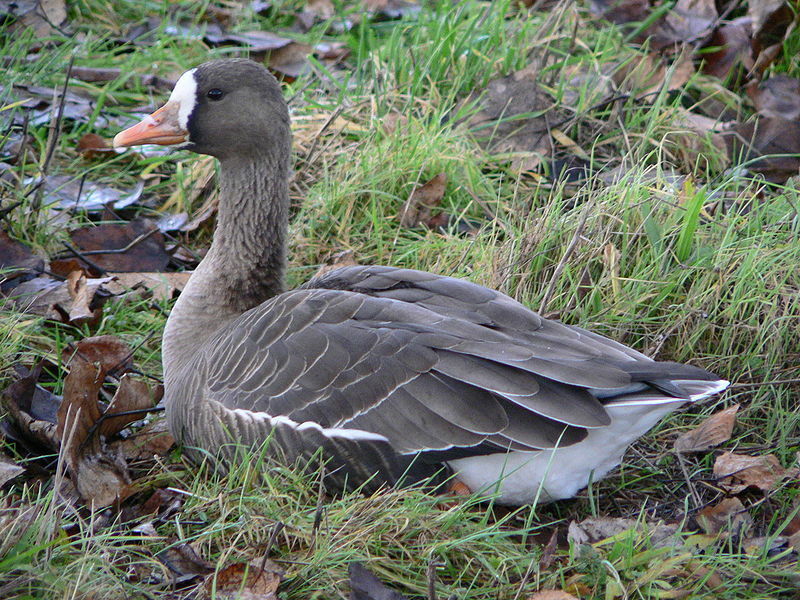 The Greater White-fronted Goose is divided into four subspecies. The nominate subspecies A. a. albifrons breeds in the far north of Europe and Asia, and winters further south and west in Europe. 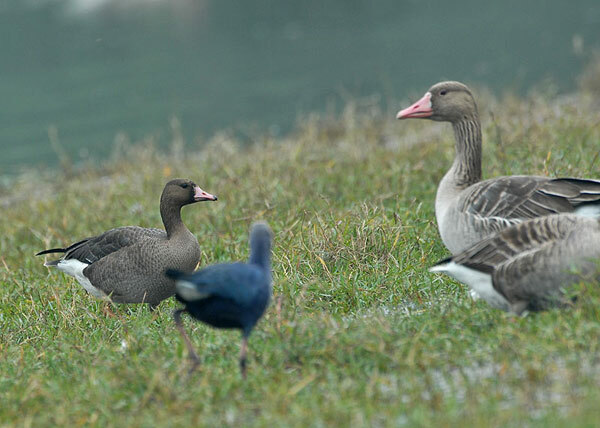 Two other restricted-range races occur in northern North America: A. a. gambeli in interior northwest Canada, and wintering on the coast of the Gulf of Mexico, slightly larger than the nominate form, and Tule Goose, A. a. elgasi, in southwest Alaska, largest and longest-billed of all, wintering in California. All these races are similar in plumage, differing only in size. Finally, the very distinct Greenland White-fronted Goose, A. a. flavirostris, breeding in western Greenland, is much darker overall, with only a very narrow white tip to the tail (broader on the other races), more black barring on its belly, and usually has an orange (not pink) bill. It winters in Ireland and western Scotland. This entry was posted in Birds, Birdwatching, Christian, From The Past and tagged Anatidae, Birds Illustrated by Color Photography, Greater White-fronted Goose, Home School, Kids, Laughing Goose, Photography, Vol 2 #5 Nov 1897, Youth. Bookmark the permalink.